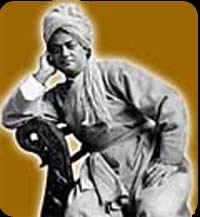 “To put the Hindu ideas into English and then make out of dry philosophy and intricate mythology and queer startling psychology, a religion which shall be easy, simple, popular, and at the same time meet the requirements of the highest minds—is a task only those can understand who have attempted it. He also talked about how practice should also include the health of the body, to take care of what we eat and drink, and what we do. I agree with this wholeheartedly. If you don't take care of yourself, how can you practice meditation? Yoga is all about caring for your body, mind and soul, with intention. There is a simple concentration technique that not only helps you to calm your mind for meditation, but also helps strengthen the muscles of your eyes. One of the side effects is better vision. Another side effect is that it trains you to focus and slow down your thought processes. Concentrating on a flame is an easy way to begin. This technique is a wonderful way to train your eyes to relax, softly closed, while you focus between your eyebrows. It especially benefits anyone who sits in front of a computer all day, which weakens the eye muscles significantly over time. In fact, children today will probably all be wearing glasses at an early age if they continue to stare at monitors all day, especially without filters. This is the best way to train your child to focus while they also strengthen their eyes. I have had great success treating children who were completely out of control just by teaching them how to focus on an object. I also had them write down all their associations during these short sessions as part of their reading and writing skills training. All the children whom I have been lucky enough to teach this method to have been helped enormously. Their grades improved significantly. Even if you are not trying this technique, it is relaxing to have a candle burning in a dark room when you first begin to meditate. Until you have practiced and relaxed your mind enough to pay attention to what you are doing, having your eyes closed can be helpful. But as you continue your practice, you will definitely want to be able to meditate with your eyes open without being distracted by your surroundings. We are each filled with light in the same way as a candle. When we enter into meditation, it is not uncommon to see a bright white light between the eyebrows. Just relax and absorb it. Don't be afraid of the images your mind brings into focus. Place the candle on a table in front of you—at a distance to protect it from a draft or anything too close that could be dangerous—(about 4 feet away from you) and turn all the lights off in the room. The quiet little flame will burn upward. Sit with your back straight and the soles of your feet on the floor (no crossed legs). Place your hands on your thighs with the palms facing up. Relax your mind and then begin by stretching your eyelids and all around your eyes. Stare at the candle flame in front of you. Stare at it long enough so that everything else in the room disappears and all you see is the flame. When you think that you have the flame imprinted in your mind, gently close your eyes. Most people see something in the middle of their eyebrows. For some it is the flame, vivid and clear. For others, it can be a purple, red, orange or blue object or point. Whatever it is you see in between your eyebrows, hold it there right in the center as long as you can. The object you are seeing in your mind's eye will start to move and perhaps go to the left, the right, or down. But you won't let it. You will bring it back to the center where it was from the start. And this is all you have to do, until you no longer see it. Then merely repeat the same process. Open your eyes, stretch them, stare again, and then close your eyes and hold the image that comes in between your eyebrows. Start for only 5 minutes and work your way up to 30 minutes per day. Once you feel the benefits, you can work out how long your eyes need to continue to feel stronger. Note: The only time you will not bring the light back is when it starts to move up to the top of your head. If that happens, just follow it and enjoy whatever happens. This does not happen often, but I have to mention it, just in case. It can be a wonderful experience. However, it doesn't work to try to move your eyes in that direction! It must be spontaneous. As you practice this meditation, you will begin to feel that you are carried away from yourself into the light. It can be a very relaxing technique to relieve stress. This ancient eye meditation is also considered a powerful exercise that is taught at some of the major eye institutes in the world. I had a yoga student in Sweden who had one eye that roved, and after he practiced this technique, his eye began to focus. It was truly remarkable. I never knew where to look at him. It was disconcerting. Then one day, he smiled and looked at me and I didn't notice anything odd about him. He was an American in Stockholm, Mike. He said it changed his life. According to the Hatha Yoga Pradipika, “being calm, one should gaze steadily at a small mark, until the eyes fill with tears. This is called Tratika by acharyas. This practice eliminates diseases of the eyes, removes laziness (and so much more). When I worked as a tutor for College Bound in Princeton, New Jersey (a great organization of adults who care about helping minority children with additional education), I taught a very young girl how to focus on an object. She was to focus on, for instance, a lemon, for 5 minutes. Then she was to write two paragraphs about everything she thought about while she focused on the lemon. This was the best way I knew how to help this adorable girl focus to be able to study more efficiently (my main goal was to help her with reading and writing). It worked better than any drugs for so-called Attention Deficit Disorder ... something Yoga can heal without any chemicals! She is now an A student and is always reading, so Trataka worked for her. Her teacher told me she could not believe the difference it made in such a short time. Children love to play games, and it's always more positive to teach them games where they also learn to love to learn!